Is It Selfish to Keep This French Line's Restock a Secret? Warning: as I'm writing this, there's a good possibility that the items below are slowly ticking out of stock. Jeanne Damas's Rouje has amassed such a cult following, that fans (including myself) sign up for newsletter alerts announcing restocks. Additionally, pay a visit to any resale site, and you'll see the brand's romantic dresses and cool tops selling for more than their original prices. We have one word for all of this: obsession. So, with all that in mind, we wanted to let you in on a secret: These French-girl staples are back, but not for long. So, if you're ready to treat yourself to a little something for summer, this might be the perfect occasion. 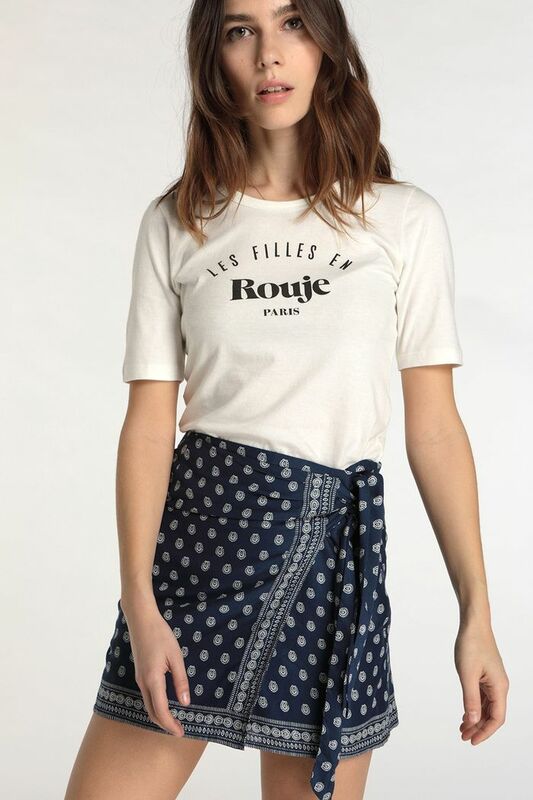 Now, you'll just need to find a pair of espadrilles and maybe a beret (bonus points for a baguette and cheese), and you can achieve that certain je ne sais quoi that keeps us refreshing Rouje's new arrivals page. Check out a few of our favorite pieces still in stock below—happy shopping! We're taking back every negative thing we ever said about miniskirts. Get this wardrobe must-have before it sells out… again. The only dress you'll need all summer. An easy way to rep your favorite French brand. This dress came straight out of our dreams. The polka-dot blouse we've been waiting for.